Zapier is an online automation tool that allows you to instantly connect Aisle Planner with 1,000+ apps, such as Quickbooks, Gmail, and MailChimp, to automate your work and push productivity. You can connect two or more apps to automate repetitive tasks without coding or relying on developers to build the integration. Move info between your web apps automatically, so you can focus on your most important work. It's easy enough that anyone can build their own app workflows with just a few clicks. What Can I Do with Zapier? When a new lead is automatically added to your lead manager, you can set up Zapier to send your phone a text notification and add that lead to a MailChimp list or other marketing automation platforms. You can even add the new lead contact information to your Google Contacts. When a client makes an online payment or you record a manual payment on an invoice, you can sync that information to Quickbooks. When you create a new project, it can trigger an email through Gmail to send your new clients a welcome message. What Aisle Planner triggers are supported in Zapier? What Aisle Planner actions are supported in Zapier? 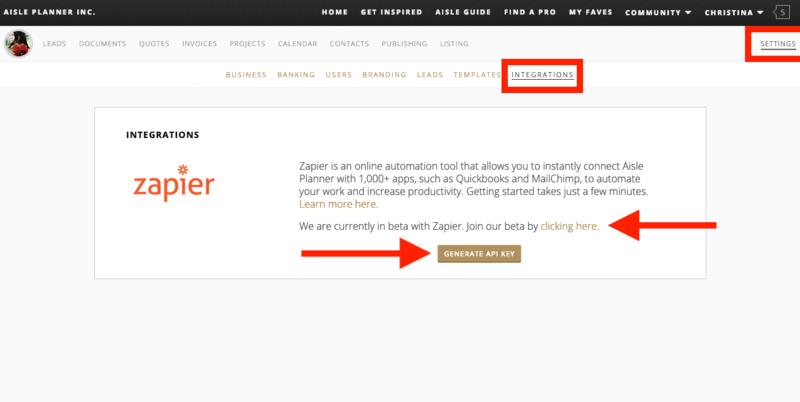 Currently, our Zapier integration is in "beta," which means we're still testing this integration and working through the kinks. If you're an experienced Zapier user, we'd love for you to join our beta program! Click the invitation link here to join our beta program and get started - you'll be taken to your Zapier account log in - once you've logged in, go ahead dive right in. Oh! You'll need your Aisle Planner api key to plug into Zapier. You'll find that in your Integrations tab, within in your Settings menu, towards the top right of your pro dashboard. We're still learning the ropes when it comes to Zapier Integrations, so if you've joined our beta, we'd love your feedback and insight on what we can do to streamline your zaps and make it easier for Aisle Planner to share information with other apps that you use to get your job done. Are there any Zap templates you'd like us to pre-populate? Are there any triggers or actions you'd like us to bring online? We'd love to know! Message us using the messenger you see towards the bottom right of your screen, or email us at customercare@aisleplanner.com. Meanwhile, we'll post additional information here once we've made it through our beta testing phase. Stay tuned!